This post is brought to you by Google Home. Huevos rancheros are the most perfect vegetarian meal. There, I said it. 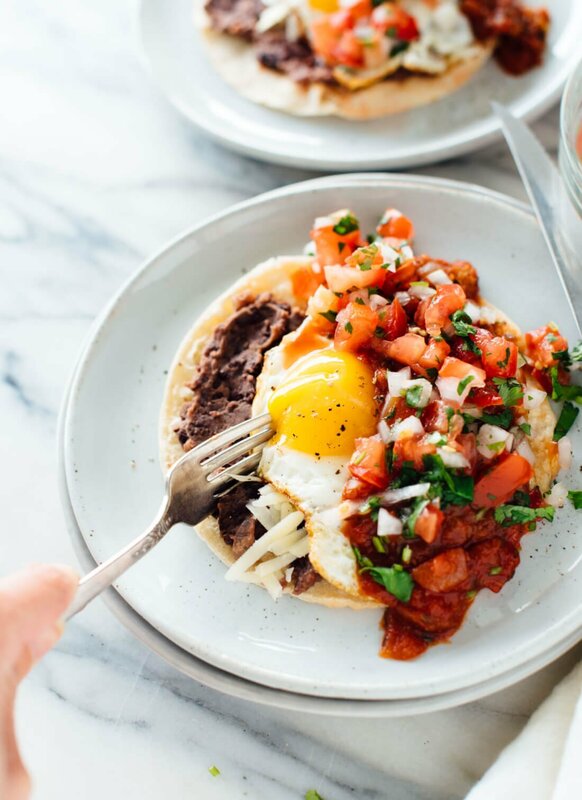 Huevos rancheros (or rancher’s eggs) are a typical breakfast served at Mexican farms, featuring corn tortillas and fried eggs topped with plenty of warmed salsa. They’re the answer any time I’m craving extra protein or a super hearty, quick meal. I can’t resist them on a brunch menu, either. 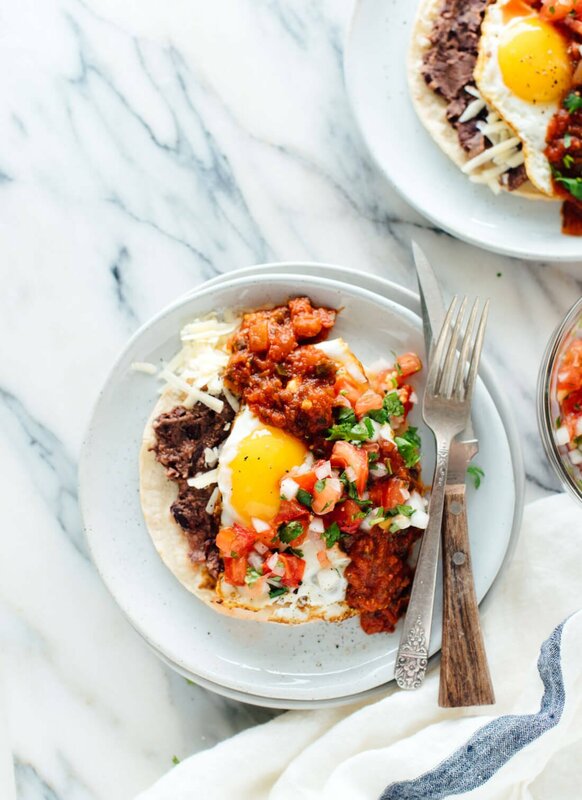 I’ve been perfecting my huevos rancheros at home, so I’m excited to share this recipe with you! Beans are often a component, and I bulk up my version with lighter “refried” black beans. Then, I coax extra flavor out of my fried eggs by cooking them in a generous drizzle of olive oil, which produces irresistibly crisp edges. When tomatoes are in season, I top my huevos with pico de gallo in addition to salsa, for extra-fresh flavor. It’s definitely worth the effort if you have access to great tomatoes. Usually, I whip up huevos rancheros when it’s just me and Cookie at home. This time, we had company in the form of a cool new product called Google Home. I’m always looking to simplify and streamline my life and work, so I was excited when Google asked me to try it out. 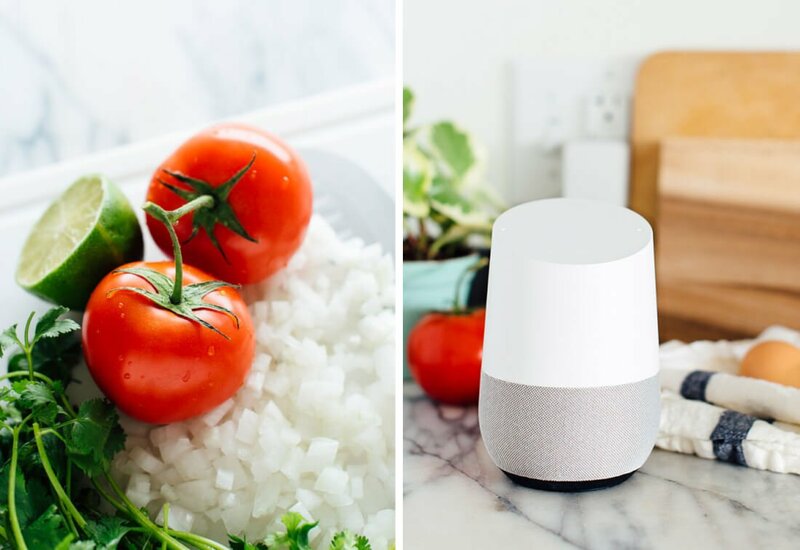 Google Home is my new kitchen assistant, basically. 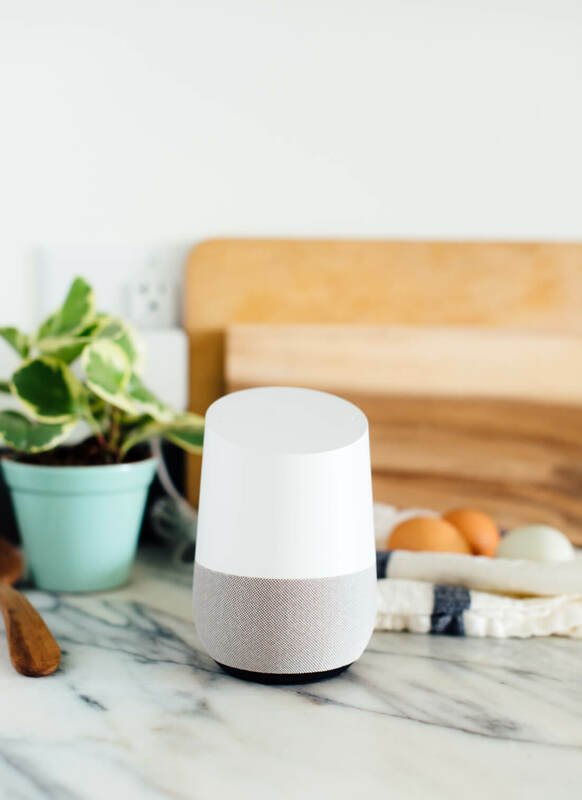 It’s a small, sleek speaker that responds with an impressively human-like voice every time I say, “Ok Google,” or “Hey Google.” I can ask Google Home to set a timer (or multiple timers) for me—is it just me, or are your hands always messy when you go to set a timer? My new assistant is gracious and on-call 24/7. It will turn down the temperature of my home, via my Nest thermostat, and play music on command. I can ask it for tomorrow’s forecast and itinerary as I’m making dinner. I’m only beginning to learn its many uses, but it’s already a game changer. Instead of opening up tabs and apps to get something done, I just ask out loud. The future is now! I’ll be showing off my new Google Home on Instagram Stories today if you’d like to see what I’m talking about (we’re @cookieandkate), and you can get one here. Please let me know how this recipe turns out for you in the comments! I’m always so eager for your feedback. 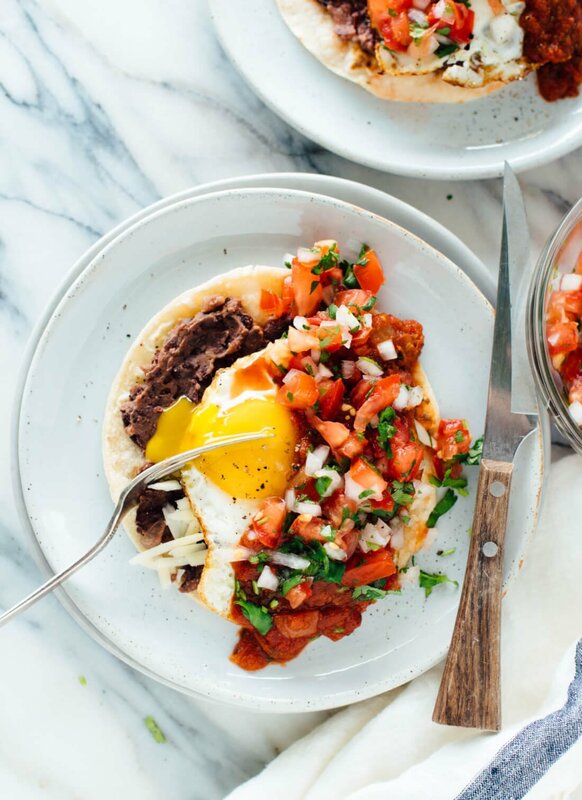 This classic huevos rancheros recipe features fresh pico de gallo on top. Huevos rancheros is a vegetarian Mexican breakfast with eggs, tortillas and salsa. Recipe yields 4 hearty but modest servings of one tortilla and egg each, so multiply the recipe if necessary. To prepare the pico de gallo: In a medium bowl, combine the tomatoes, onion, cilantro, lime juice, and salt. Stir to combine, then set the bowl aside for later. To cook the beans: In a small saucepan over medium heat, warm the olive oil until shimmering. Add the onions and salt. Cook, stirring occasionally, until the onions have softened and are turning translucent, about 3 to 6 minutes. Add the cumin and cook, stirring constantly, until fragrant, about 30 seconds. Pour in the drained beans and water. Stir, cover and cook for 5 minutes. Reduce the heat to low, then remove the lid and use a potato masher or the back of a fork to mash up about at least half of the beans. Continue to cook the beans, uncovered, stirring often, for 2 to 3 more minutes, until thickened. Remove the pot from the heat and stir in the pepper and lime juice. Taste and add more salt, pepper or lime juice if necessary. If the beans seem dry, add a very small splash of water and stir to combine. Cover until you’re ready to serve. In a small skillet over medium heat, warm each tortilla individually, flipping as necessary. Spread the black bean mixture over each tortilla and place each tortilla on an individual plate. Set aside. To fry the eggs: In the same skillet over medium heat, pour in 1 teaspoon olive oil and wait until it’s shimmering. Carefully crack an egg and pour it into the skillet without breaking the yolk. Fry the egg, lifting and tilting the pan occasionally to redistribute the oil, until the whites are set and the yolk is cooked to your preferred level of doneness. Place the fried egg on top of a prepared tortilla and repeat with the remaining eggs. Spoon about one-fourth of the warmed salsa across each dish, avoiding the egg yolk. Use a slotted spoon or fork to do the same with the pico de gallo, leaving the messy tomato juices behind. Sprinkle with freshly ground black pepper and add any additional garnishes you might like. Serve immediately. If you don’t use up all of your beans, leftovers are a great dip for tortilla chips. *If tomatoes aren’t in season: You might want to skip the pico de gallo, and top your dish with some chopped cilantro and avocado slices instead. Leftovers tip: If you won’t be consuming all four servings of this dish right away, store the individual components separately and fry your tortilla and egg just before serving. Change it up: Try salsa verde and sliced avocado instead of red salsa and pico de gallo. Make it gluten free: Be sure to use certified gluten-free corn tortillas. Make it dairy free: Omit the cheese! This post was created in partnership with Google Home and I received compensation for my participation. Opinions are my own, always. Thank you for supporting the sponsors who support C+K! I LOVE huevos rancheros. Mine end up a little different every time depending what we have lying around. Sometimes we add (cooked) frozen hash browns, fruity salsa, or vegetarian chorizo (husband’s favorite!). I really prefer it with avocado and cilantro. We don’t usually have tortillas, so often make it over tortilla chips. I think I need an assistant and a way to get my fried eggs to look like that! When tomatoes are not in season the only suitable tomato I have found in the Campari tomato. It actually tastes like a tomato something other tomatoes in the off-season do not. Great tip, Crispin. I’ll have to search for those! My fiance and I don’t like eggs….I was thinking, could the eggs be substituted with pieces of roasted tofu? If so, what kind of seasoning would you use on the tofu to complement the salsa etc. Thanks! Look forward to your book and use your recipes all the time! Hi Victoria! So, you could just skip the eggs and add avocado for some extra richness. You could also double the beans for even more protein. Or, cubes of baked tofu sounds interesting—I would probably toss it in some chili powder and cumin before roasting. Here’s my crispy baked tofu recipe! We pre-ordered your book a few days ago – we don’t purchase many books, and even fewer cookbooks, but your recipes have been great for both me and my husband. He’s even starting to cook more with your recipes! Last night, he suggested we buy it for all the couples we know getting married this summer so we’re going to get it from our local bookstore as soon as it’s out (the first wedding is in a few weeks). Thanks for such a great site and we can’t wait for the book! Oh, what a great idea, Nicole! I hope you and your friends love the book. Let me know which recipes you try and love, okay? 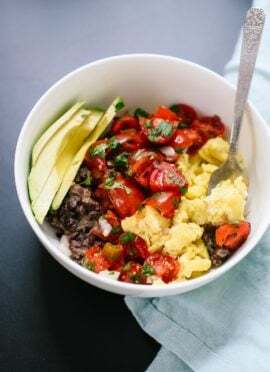 I love the idea of topping off huevos rancheros with pico de gallo, definitely trying this out next time I make them. I’ve never met a grape tomato I didn’t like! The recipe is making me hungry – I will try today. Thanks Kate! Thanks, Lisa! How did it go? I like this recipe – very tasty. I used a vidalia onion and a little extra cumin and it worked out great. I have pre-ordered my cookbook so looking forward to trying your salsa recipe!. Like promised, I made this for mother’s day breakfast for my aunt and cousins and they loved it. We are a Jamaican family and This was really new for them. Thanks for a great recipe. I’m so glad it was a hit, Sharnette! Gorgeous Huevos Rancheros! It’s one of my favorite breakfasts to make, and I especially love it for dinner. Can’t wait to make this!! Thank you, Deborah! Let me know how it goes! Huevos rancheros + pico de gallo! This recipe couldn’t be more mexican jajjaja. This recipe is the perfect start up for my weekend. Thanks! Hahah! I’m so glad I hit the mark with this one, María! This was amazing! And I was even missing cilantro, onion and cheese. Can’t wait to try it with all the ingredients, but it’s one of those recipes that is super adaptable. I’m glad your version worked out, Sierra! Tried this recipe for dinner and loved it, its yum and fast and can totally be made low carb by skipping the tortillas! Hi Kate! We love your recipes and my husband is usually a pretty picky eater! We ate a ton of your soups throughout the winter. Now that its summer, we’d love to cook outside more. Any recipes you can share for the grill would be SO SO appreciated. Thanks, Julie! I’ve added it to my list. 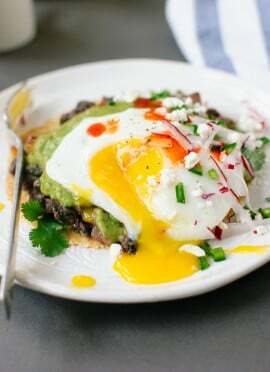 I’ve just tried this recipe, the first time I have had huevos rancheros. Simply one of the greatest foods I have ever tasted. Thank you. Hooray! Thanks, Kate! I’m so glad you enjoyed these. 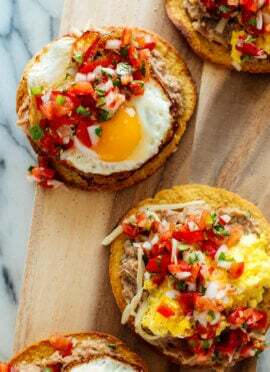 I kept passing over this recipe when browsing because I already have a favorite version of this with tomatillo salsa, but now that I tried these I’m just going to have to do double time on the huevos rancheros! I didn’t even use any cheese or avocado and I was sold on the first bite! I gently microwaved homemade garlicky tomato salsa to save washing a pan, made the pico with grape tomatoes and green onions, and stacked the bean spread tortillas on top of each other, 2 to a plate. Delicious. Started from this recipe (thanks!) but with additions. Did the beans from dried in the InstantPot before transferring to a pot for refrying. While refrying, I added some cayenne pepper & some chilli sauce (standard tabletop bottle). Best refried beans ever! I also added some diced chorizo, streaky bacon thin strips all fried with leftover onion. I added all the optional extras!! Awesome! Your version sounds great, James. Let me preface this by saying that I’m not a good cook. My husband usually does the work and leaves me with the dishes (hehe). But since I went vegetarian, my husband has asked me to start cooking since he doesn’t know what to make that’s meatless. After several botched attempts at meals, I decided to stick to the recipes and made this last night. The refried beans not only turned out delicious (seriously need to make these more often), the eggs were so good, and my husband was impressed. I left the cilantro out of the pico and replaced it with a freshly diced jalapeno , which gave it some nice heat. But wow! Absolutely delicious, and definitely a family favorite for us now. Thank you for this incredible recipe! Looks yummy! I am going to try this for sure. Can you tell me, Which one is the healthy cookware sets ceramic cookware or traditional cookware? Hi, sorry for the slow response! Stainless steel is safe, as is cast iron. I haven’t tried ceramic cookware yet because I haven’t found any with great reviews. Looks Delicious!! Thanks for sharing this recipe. Sounds wonderful! Thank you, Michelle for your comment and review. We tried this today and it was yummy… as are a lot of your recipes!! Thank you I look forward to cooking your recipes a lot!! The first time making (or even eating) huevos rancheros! This was so delicious and was a great hit with my husband and adult son (who are normally meat lovers!). I’m enjoying discovering new vegetarian recipes on your website. Wonderful, Kathy! I love that. Absolutely fabulous! Used campari tomatoes (Costco) for the pico de gallo, loved the warm salsa contrasted with the cool pico. The beans were unbelievably good. I usually use garlic in them but no more! They are superior this way! Had avocado and more cilantro to garnish. My husband had two and then a third without the egg!!!! Made this for brunch today and already making a mental note to have one day for Upside Down Dinner (breakfast for dinner). Your recipes NEVER need any adjusting, Kate. Perfect as always and your photography makes them irresistible!! Google home or not this recipe totally rocks! I saw it on your insta y’day and my mouth watered. I am a sucker for Mexican food and veggie dishes/recipes are so hard to find. I had some left over beans, three tortillas shells and left over Indian version of pico de gayo from last night’s dinner. I had these for lunch just now with all the toppings and left over scrambled eggs from b’fast (can’t handle the runny yolk) with a few squirts of Cholula. So delicious! Thanks so much! Thank you, Michelle for sharing! I appreciate your review. Excellent. Late breakfast, early lunch (brunch) on Memorial Day weekend. Lots of flavors, very healthy, outstanding! This has become our go-to breakfast-for-dinner meal that we can cook without much planning ahead, since we keep so many of the ingredients on hand. It’s perfect for those nights I feel too overwhelmed to figure out what to make! You are on a roll, Taija! I love it. Thanks for another review. Another great recipe as usual, thanks for doing what you do I love your website. I LOVE this recipe, I made it over the summer and used feta cheese but tomorrow I am going to use the catija and can’t wait! Thank you for sharing this recipe with us :) my sister loves it as well and says “it’s one of the best things she’s ever eaten”. Thank you, Kimberlee! I appreciate your review and happy you loved it. I have just done it and it came out great! Only i used basil instead of cilantro as i am not big fan. Hi, I’m originally from Guadalajara, Jalisco Mexico, where Tequila is distilled, home of the Mariachi, Balet Folklorico and traditional Mexican food. I have never made salsa ranchera with pico de gallo before. Pico de gallo is a cold salsa for tacos. 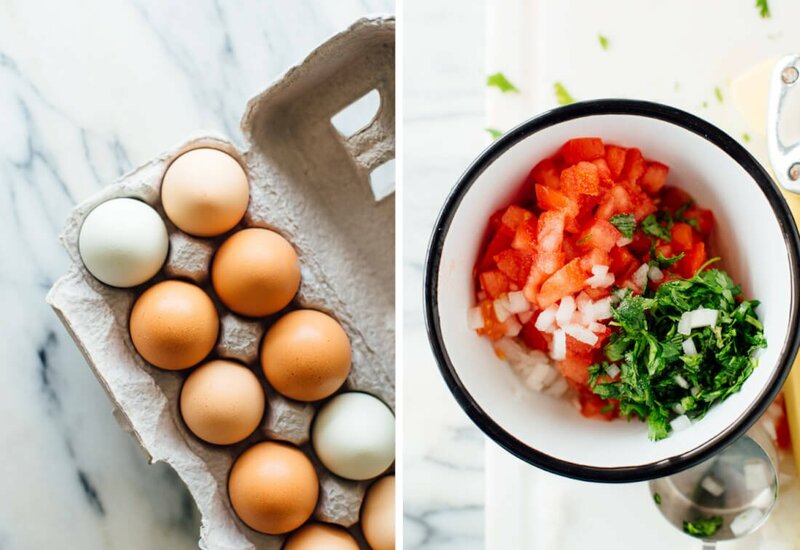 We tried your version of using pico de gallo for huevos rancheros. We didn’t like it. Traditional salsa ranchera is made for each person 1 peeled roasted long green chili, 3 roasted tomatoes, sauteed onions, sauteed garlic and salt. We cook the ingredients together until the tomatoes break down into a salsa. We fry two tortillas into hard tostadas. We fry our eggs Spanish style – heated oil in low heat, as the egg solidifies we spoon the hot oil over the eggs to cook from above, but leave the yolk runny. We lay the eggs on the tostadas and heat salsa over the eggs. Serve with refried beans, Spanish rice and heated tortillas. I’m sorry you didn’t love it, but thanks so much for sharing your experience! I try to keep recipes as authentic as I can. Again, thanks for sharing! Thank you, Mine was a little simple but had some great imported Mexican salsa. I inhaled it..where did it go?